I just found out about a great new product for Celiacs on the go: ThinkThin Bites! I've previously posted about my love of ThinkThin Bars (find it here) and all of the other great ThinkProducts and am excited to try out the company's newest product: ThinkThin Bites. 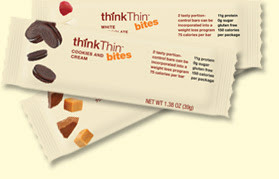 ThinkThin Bites are smaller versions of the company's ThinkThin Bars. Full-size ThinkThin bars contain 20g of protein, while the new ThinkThin bites contain 11g of protein. While they are marketed as weight loss bars, I use them as great on-the-go GF snacks, particularly when I don't have time in the morning to make a lunch. I have yet to try the company's ThinkThin Bites, but all three flavors (Chocolate Toffee Nut, Cookies and Cream, White Chocolate Raspberry) are certified gluten free. These bars are a great to bring with you when traveling, as they provide plenty of protein and are absolutely delicious. I have loved every ThinkProduct I've tried in the past and I am hoping these don't disappoint! If you have already tried them, please leave me a comment and let me know if you enjoyed them. Available at Whole Foods, Trader Joe's, select other grocers, and through the company's website. I love these products! I recommend them to the gluten-free and wheat eating people alike. I had one of the full size one's for breakfast on the way to preschool.